In a race which could easily have been passed off as a Group One contest such was the quality of the field, the 16-1 winner showed he was not there to make up the numbers when continuing the purple patch of Frankie Dettori. Estidhkaar was sent on by Paul Hanagan approaching the final two furlongs in what looked a decisive move, but Dettori had other plans and Muhaarar ranged alongside before withstanding a late fightback to stay on strongly for a neck success in a course-record 1 minute 20.80 seconds. The runner-up's stable companion Ivawood finished another four and a half lengths back in third. Winning trainer Charlie Hills said: "I always knew he was a good horse as he won the Gimcrack, it was just a question mark if he'd get the trip. They went a good, solid pace and he travelled well throughout the race. If anything he got there a bit too soon. "Frankie said the French Guineas would suit him, but we will see how he comes out of the race and the decision is up to Sheikh Hamdan where he goes. The 2000 Guineas will be on the agenda, but that is a decision he will make. "He's got a great cruising speed and we tried him over seven last year, but he just saw a bit too much daylight. I think the horse has grown up mentally and is so much more relaxed than last year, and that will stand him in good stead for the future." Although watching both Estidhkaar and Ivawood taste defeat, Richard Hannon was far from despondent about the performances of both horses. 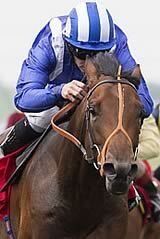 He said of Estidhkaar: "He ran a super race and we are absolutely delighted. 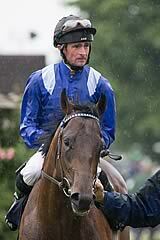 He will go to the 2000 Guineas with every chance and has got the ideal profile for a Guineas horse. Looking at that, he was coming back at the line." He added of Ivawood: "Ivawood will come on a lot for that. He is a horse that carries a lot of weight and will improve a lot for the run." Roger Varian's Dewhurst winner Belardo was slowly away and while flattering briefly, faded to beat just one home in Flaming Spear. Varian said: "The ground was too quick for him and he didn't let himself down on it. He is still a very good horse but he will be ground dependent and will be winning good races later in the year. "I would not rule out the Guineas, but he would not run in it if it was fast ground." There was a minor sting in the tail for Dettori - who rode a treble on the day - as he was suspended for two days for his use of the whip. H e will sit out the action on May 4 and 5. Bookmakers trimmed the winner's odds for Classic glory at Newmarket on May 2 and he is as short as 10-1 with Coral, while Gleneagles was also cut, with 2-1 the top price left available with William Hill and RaceBets.